Dried Moroccan fruits and dates in particular are not only key staples in Moroccan cuisine, they have a rich cultural and historical significance that goes back many thousands of years. As early as 6,000 BC there is evidence to suggest that the date palm was cultivated and harvested in North Africa and the Middle East not only for its sweet and delicious fruit. As well as the nutritional benefits of the date palm, rope, lumber and other household items could be crafted from this important staple. Within a religious context, the date palm carries significance in the holy Qur’aan and is particularly important in the religious month of Ramadan in the Muslim world. In this month of fasting, dates are often the first food to be eaten as the evenings fast is broken. 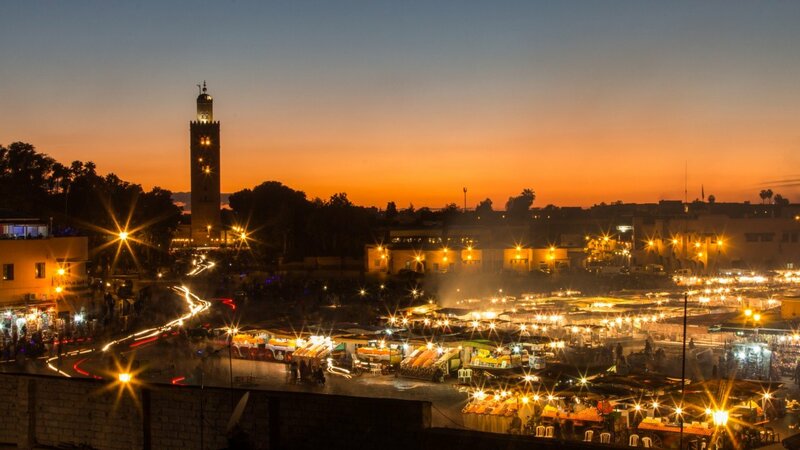 In the ancient square of Jemaa al-Fnaa you will discover an outstanding array of dates and dried fruits. As you explore the labyrinths which are the souk districts, there can be no better to keep yourself energised than by snacking on this sacred delicacy. On my walk from the Riad Dar Habiba to the red city’s central square I pass this date salesmen almost every day. I buy a small bag of dates a few times a week for only a few Dirham’s and it provides a great opportunity for me to practice my Darija Arabic! During your stay in Morocco, sampling some of these delicious fruits for yourself is something you cannot afford to miss!